Great Sand Dunes Family Camp out!! | BSA Troop 287Great Sand Dunes Family Camp out!! Great Sand Dunes Family Camp out!! 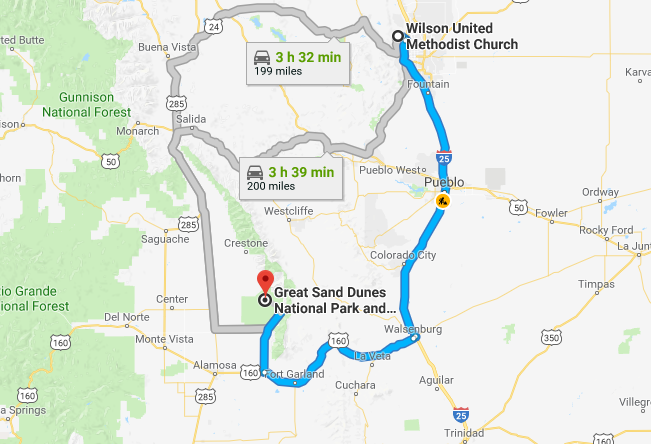 See directions from Wilson United Methodist Church to Great Sand Dunes National Park and Preserve in Google Maps. Roughly a 2hr 40min Drive. Attendance: This is a family campout and we are planning on having a good turn-out! Scouts are divided into two patrols. 5:30pm Meet at Church, load gear, cross load kids and gear if needed, and depart as soon as we can (hopefully by 6pm at the latest). $12 per scout for food or so for food. Campsite is unknown at this time since we are looking at getting about four sites to accommodate everyone. Scouts will prepare their own food. Evan and Austin are buying the food and overseeing the cooking activities for their respective patrols. Note that scouts will bring their Friday dinner with them…a Subway Sandwich or something like that. Depending on weather and the time we arrive and establish camp, we may have a camp fire and have some community. Adults will bring/prepare their own food. Adults are more than welcome to combine resources and prep “group” meals, but of course, that is on your own. We will have some Dutch ovens and will likely share breakfast and dinner. Lunch will be on our own while we are on the Dunes (hopefully high dune). 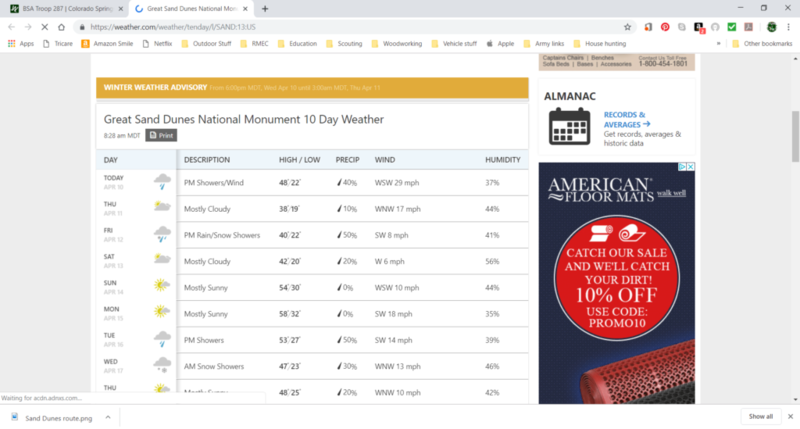 Sleeping Bag – CHECK the weather and make sure your gear is rated to keep you warm!!! Sleds, Snowboards, Cardboard box for sliding down the sandhill. Sand will ruin your equipment so I don’t recommend good sleds or snowboards.